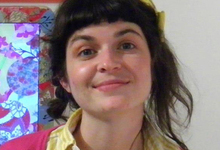 Jodie Mack is an experimental animator who received her MFA in film, video, and new media from The School of the Art Institute of Chicago in 2007 and currently teaches animation at Dartmouth College. Combining the formal techniques and structures of abstract/absolute animation with those of cinematic genres, her handmade films use collage to explore the relationship between graphic cinema and storytelling, the tension between form and meaning. Musical documentary or stroboscopic archive: her films study domestic and recycled materials to illuminate the elements shared between fine-art abstraction and mass-produced graphic design. Questioning the role of decoration in daily life, the works unleash the kinetic energy of overlooked and wasted objects.